At City Carpet Restorations Gold Coast, we have a Master Rug Cleaner (accredited by IICRC) to professionally clean and restore your valuable rugs. We can clean your rugs on-site at your home or, for a more thorough service for delicate or valuable rugs, at our rug cleaning facility where we have specialised cleaning equipment and a dedicated drying room. 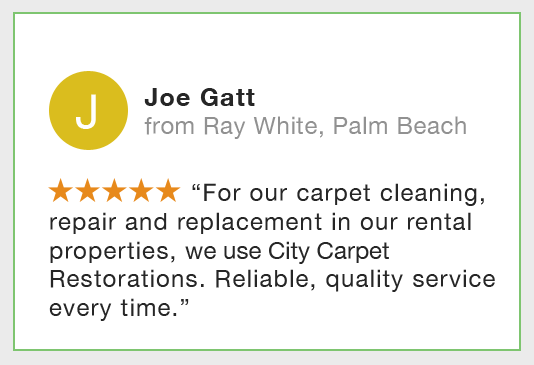 Once cleaned and dried, your rugs will be returned, usually within 5 days. Thorough inspection of fibre type, construction method, soiling and general condition. Step 2. Pre wash process. Vacuum with commercial vacuum and beater bar. Treat stains. Test for colour fastness. Apply appropriate cleaning agent. Gentle agitation. Hot water extraction. Hand wash fringes. Thorough rinse. Step 4. Drying and finishing. Place rug in our temperature and humidity controlled drying room.